"How to Market YOUR Business on the Chamber Website"
Do you want your company name to pop up when prospective clients are searching the Chamber website? Do you want to increase your visitibility in the business community? Do you want to promote your company to all who are in need of your services/products? This seminar will teach you how. 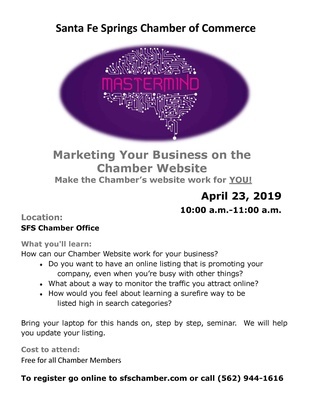 This is a hands-on seminar to show you, step by step, how to increase your visibilty by enhancing your listing on the chamber website. By adding key words, photos, videos and descriptions you can make your business listing stand out - for free! Please register so we can personalize the seminar to those in attendance. The Mastermind Series are classes offered by the SFS Chamber to educate and expand our members presence in the business community.